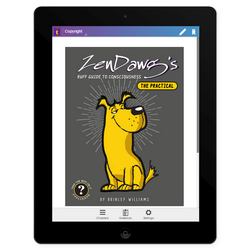 The ZenDawg ebooklet series is a simple guide to consciousness. In Part 1 of the guide you will learn the fundamentals such as what consciousness is and the basic components responsible for creating conscious experiences. In Part 2 of the guide the focus turns to identifying all the basic components yourself through self investigation and self study. This will then provide you with the necessary knowledge to be able to determine what effects each has on your conscious experience. In turn this will enable you to make changes or tweak your conscious activity in order to make changes to it. In time the series will include a Part 3 & $ but it will differ from the previous guides in that it will be less structured as it will focus on the more peripheral questions regarding consciousness.